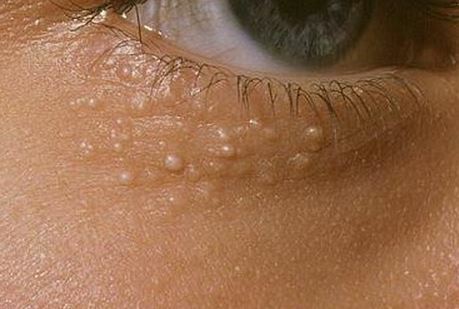 Milia is a very common cystic condition of the skin. They are basically very small cysts, which result from small hair follicles blockage and mostly around the eyes.They mostly occur below the eyes and at times on the lids. Tweezing them is not recommendable as they never pop. They are cysts and the walls around them are tough. You get the cysts as you grow older. In addition, there are some predisposing factors to this condition which include a dry skin. They disappear by themselves at times. However, the following procedures will assist you get rid of milia under eyes. You can get rid of milia under eyes with use of a needle and it is better to have a dermatologist or an individual specializing in minor surgery demonstrate the procedure to you. Generally, you only nick your skin very superficially and very gently so that the skin does not bleed. This will break the cyst wall and you will squeeze out all the contents. Milias never return to the same place although you may get some more in other different places. However, before using a needle, consult a medical practitioner if you are not certain that they are milia. A facial sauna loosens and removes any debris and dead skin cells and therefore it is useful in unclogging pores and in milia under eyes removal. The process requires you to clean a towel in hot water and then wring out all the excess water. Hold this towel for a few minutes on your face before removing it. Repeat the procedure a couple of times. To get better results do this on daily basis for 1 week or more. Alternative, steam your face for a period of 10 to 15 minutes on a daily basis until this condition clears. You can also apply some castor oil or cider vinegar after the steam treatment. Honey has humectants and antioxidant properties which makes it an effective treatment for milia. It retains skin moisture and also avoids skin dryness. You only need to spread some raw honey on your face. Allow it to remain for 15 minutes and rinse it with some warm water. You can do this on a daily basis until you realize some changes. Furthermore, you can mix 2 tablespoons of honey with 1 tablespoon jojoba oil and apply it directly to your face. Wait for 15-20 minutes and wash it off. Repeat this procedure daily until you realize an improvement. You can also add 1 tablespoon granulated sugar and 3 tablespoons oatmeal to the mixture to form a facial scrub. Scrub your skin severally using the scrub and then rinse it with some warm water. Repeat the procedure once or even twice in a week until you realize some changes. Rose water and sandalwood combination can free you from excess oil and also remove dead skin cells and therefore reduce milia. You only need to mix 2 tablespoon sandalwood powder with enough rose water to form a smooth paste. Spread the paste evenly on the face and allow it to remain for 15 minutes. Rinse it with some cool water and pat dry your face. Repeat the procedure daily for a few weeks. You can use roasted pomegranate peel powder to treat milia. It has exfoliating and antioxidant properties which makes it effective. It is also suitable for your skin as it is rich in vitamin C. it also soothes pimples and acne. Simply roast some pomegranate peels. Wait for them to turn brittle and dark brown. Then crush them to form a powder. Add a few drops of rose water or lemon juice to 2 tablespoons of the powder to form a paste. Rub it gently on your face and leave it for 15-20 minutes. Rinse it off. To get effective results, use the remedy a few times in a day. A simple sugar scrub can be effective in milia treatment due to its exfoliation properties. To make the remedy add some lemon juice to 2 tablespoons granulated sugar and 1 teaspoon olive oil. Scrub the mixture onto your face for a few minutes. Allow it to remain on your skin for at least 20 minutes and then rinse it off. Repeat the procedure twice in a week for a few months. • Avoid harsh chemicals and sunscreen oils over usage.